wasn’t going to be Livin Proof’s final destination. necessity to Obress than an additional extra. He paid close attention to the skills displayed by local rappers such as Slim and his associate Jo Da Bully. This led to him experimenting himself, putting pen to paper and letting his own personal stories manifest into music that others could relate to. It wasn’t long before he was the talk of his neighborhood; his rhymes pointing him in the direction of a legitimate career. An encounter with Rocafella Records MC, Memphis Bleek was a defining moment for Livin Proof. Bleek was impressed by his skills and it wasn’t long before the Cooper Projects star was making his way over to the notorious Marcy Projects to rhyme for Bleek and his crew. 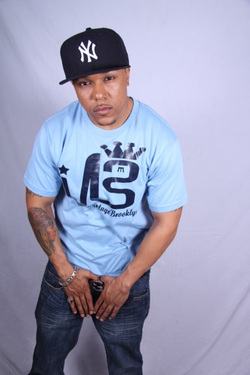 This association led to him being signed to Bleek’s Get Lo imprint along with Geda K, H Money Bags, No Luv and Calico. This affiliation led tofive Rocafella tours, where he was personally called out on stage by Jay Z to a crowd of 30,000, and an abundance of hands on experience at what the music industry truly entailed. Eager to be seen as a notable force in Hip-Hop while being recognized and respected as an artist, Livin Proof set about achieving his goals. Teaming up with contemporaries such as Memphis Bleek, Joell Ortiz, Chi Ali, Young Chris, Torae and Maffew Ragazino in the studio widened his audience. Unions such as these and the respect of his peers was of course instrumental but having the media on side was something else he was eager to procure. It was the release of his Die for a Deal mixtape in late 2012 that saw fans and media relish everything this rap connoisseur had on offer. With production on a couple of tracks handled by Fantom of the Beat (‘Magic Stick’ – 50 Cent, ‘Apollo Kids’ – Ghostface) and with appearances by his former Get Lo label mates and Jo Da Bully, the tape fared well. Appearing on acclaimed blogs such as 2DopeBoyz.com and NahRight.com and amassing over 12,000 downloads while the single ‘Krak a Ki’ was being spun on Hot97 by DJ Camilo it was apparent that all eyes were watching. Livin Proof is currently working towards the release of his debut album Die for a Deal 5.0, due 06.04.13. This will be released through his own company Heavy Promotion Entertainment and Loyalty Digital Corp in conjunction with Empire Distribution.